67 X 51 cm; 26 3/8 X 20 1/8 In. Jan Brueghel the Elder was born in Brussels into a famous dynasty of artists. His father Pieter Bruegel the Elder (ca. 1525–1569), who is best known for his peasant scenes, is generally regarded as the most influential artist of Netherlandish Renaissance painting. Therefore Jan, who was born in 1568, shortly before his father’s death, had big shoes to fill. Raised by his maternal grandmother, Jan is said to have been trained in Antwerp by Pieter Goetkint. As a young man he travelled to Cologne, and between 1589 and 1596, he worked in Naples, Rome, and Milan, where Cardinal Federico Borromeo became one of his most important patrons. He visited Prague in 1604 and was appointed court painter to the archdukes of Habsburg in Austria in 1610. In his home country his studio was based in Antwerp, where he was a member of the city’s Guild of Saint Luke. Jan Brueghel the Elder maintained a close friendship with Peter Paul Rubens, with whom he occasionally worked together, Brueghel usually providing the ‘setting’ and Rubens the figures to their collaborative works. 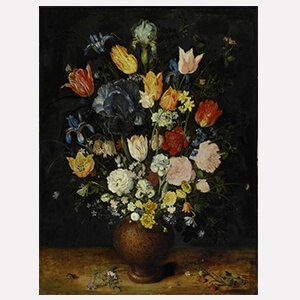 Besides being a key figure in the development of the traditional Flemish landscape painting, Jan Brueghel the Elder is regarded as the most prolific flower painter of his time. Working directly from nature, he was among the first artists to paint pictures that exclusively depicted flowers. His extraordinary skill of creating lush and delicate textures with ease earned him the byname Velvet Brueghel. His son Jan Bruegel the Younger (1601–78) was also a prolific artist, whose subjects and techniques were similar to and are often hard to distinguish from his father’s.